CT SCAN. Been there, done that. And looks like I will need to do it again in Jan. 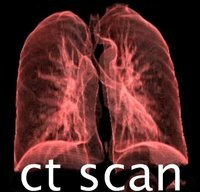 This is a picture of what a ct scan on the lungs looks like- very thin slices or the lungs, from what I understand. When I went to the pulminologist, she did a chest xray, found a shadowy looking area, did a CT scan. She looked at it, and said- and I quote, "Oh it's nothing to write home about, no worries." I breathed a sign of relief and on we went, looking to ferret out the cause of this cough. Well, had to go back this week again and she briefly whizzed through this statement and on into the conversation: "You had the ct scan last week and the radiologist has a few concerns and wants to repeat it in January." and on to other things she moved. WAIT A MINUTE!!!!!!! It took me a bit to process- she talks very fast and it wasn't until that evening that I actually thought about that statement, chewed and worried on it all night and called her the next day. "What do you mean he had some concerns?" I asked. "I told you it was a shadow, possibly some scar tissue." "No, you said it was nothing to write home about and moved on. Why am I coming back in Jan for this?" "I told you, it was a shadow, possiby some scar tissue, and the radiologist wants to look at it again in January." "No, your exact words were-"It's Nothing To Write Home About!" What concerns- if it's scar tissue, it's not dangerous and not growing, right?" "Most likely. He just wants to repeat the test in January." "Repeat it now and get rid of it if it's concern-causing." "We will wait till January." Yeah, and exactly what are YOU waiting on? I'm the one waiting and worrying! I'm the one with three children to plan for. I'm the one hacking up a lung and waking up with a stress cold sore! Darn it all anyway! I loved this doctor until this very moment. It's easy to be cavalier with someone else's life! I have to give this to God, because I am not dealing with it very well on my own. It might well be nothing, but ya know, I would rather have not known about it than have it niggle and eat at me and intrude on my thoughts. Say a prayer, would ya? I've a feeling they will be much more helpful and reassuring than the medical proffesion at large. Seek a second oppinion! Go to the ER for goodness sake and act like you have pnemonia or something. They will do a simple chest xray and if they see the spot the doctor will do another CT scan. If insurance in the problem I could understand for the wait but try to see another doctor. If someone isn't hearing your concerns don't just settle for that go see someone else. You got someone praying hard for you here in the Paris home tonight on 08/18/06 at 0320am. I have been thinking about you a lot lately, wondering about your cough. I had a lump in my breast that the radiologist is looking at every six months, and my doc indicated that the radiologists are generally very conservative, so if they wait, they are usually not worried. If they are seriously concerned, they have you come right back. The reason for the wait is to see if anything changes in that time period. If there is a change, then they investigate further. If there is no change, then their "don't worry about it" diagnosis is basically confirmed. I, personally, would seek a second opinion. As for the cough, has anyone investigated the possibility of acid reflux? That what my mother's chest-wracking cough and my office-mate's incredibly deep cough turned out to be - they are both now being treated with medicines and the cough is almost non-existent. Give the fear to God, and the medical treatment to a second opinion! My darling dear give the fear to God and ask for a second opinion. Praying sweetie. Just wondering how you are sweetie. HUGS! Saying a prayer for you! Do get a second opinion and maybe even a third, sad but true, not all doctors have your best interest at heart. We've learned this through countless years of fighting cancer. Sending you prayers and hugs!